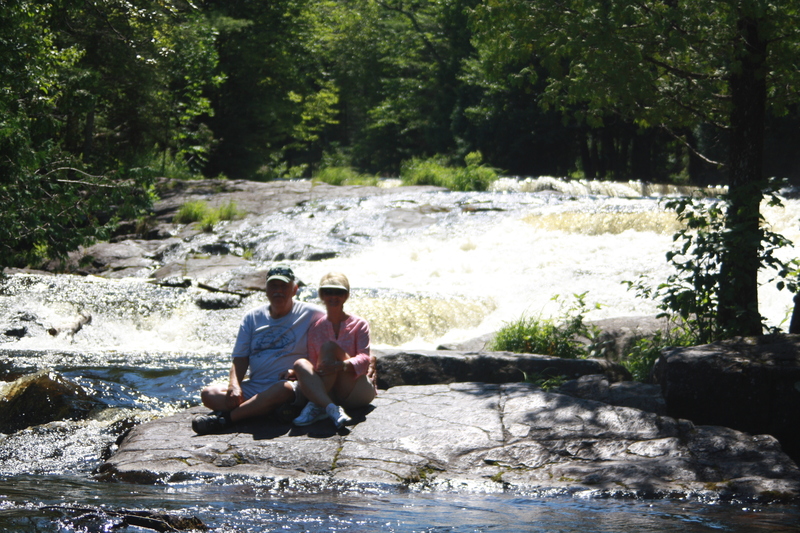 Bond Falls – Let's Go RVing! Today started off with a bang, literally! The rain was pouring and there was heavy wind, thunder and lightning. Jerry remembered that he had forgotten to put in the awning last night so we were rocking. He immediately get the awning in and our day started! It appeared that we didn’t have electricity so we were using the house battery. He thought the breaker at the post had flipped but it was raining so hard he wasn’t going outside to find out. When the rain finally lightened up a bit he went outside only to discover that the not only the campground but a large part of the area was without electricity. We rode into the town of Octonogan just to look around. There were a lot of limbs down but I don’t think there as much damage here as further north. We thought about leaving today but didn’t think we’d get a refund (we couldn’t) but instead decided to spend the morning giving the coach a much needed clean up! That done, we decided to go to Bond Falls. I thought it was only about 30 miles away but it turns out it was a bit further than that. I was worried that it would be just a little waterfall but indeed I was surprised. 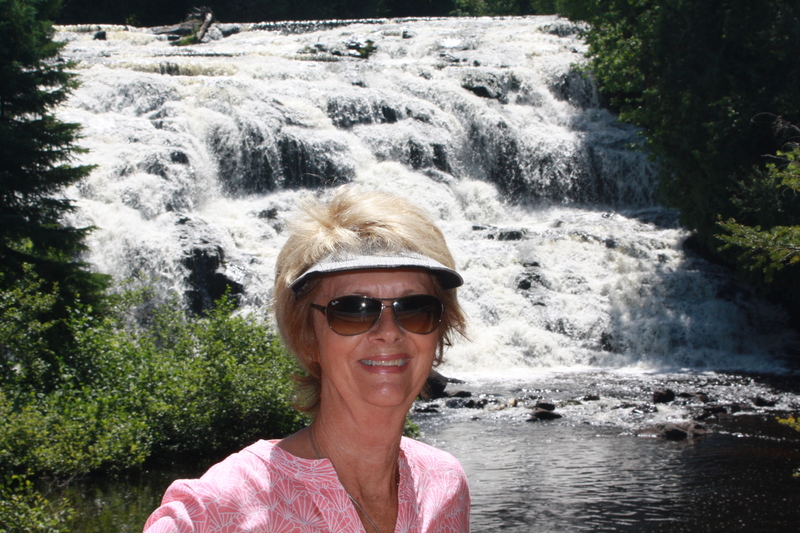 It is a lovely area with lots of cascading falls. Certainly a picturesque place, it seemed to be very popular with photographers as I saw several with their tripods. We certainly took a lot of interesting pictures! As we rode into Octonogan we saw the blinking stoplight. Perhaps the beauty salon was opened? Nope, a sign on the door saying she had gone to the beach and would be opened the next day if she had electricity so no hair cut today. Yea – but wait – yes, the town has electricity but after we got back to the campground, turned off the generator and then couldn’t get anything to work we realized that only the town had electricity at that point. It didn’t take long for the coach to start warming up with an 81 degree day. Thankfully it’s not as hot as yesterday was. 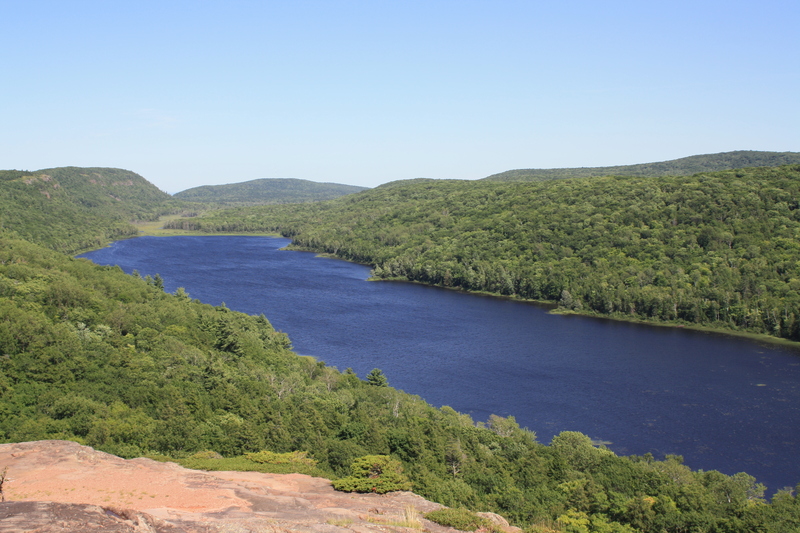 After Jerry got the generator started again we set out for Porcupine Mountain State Park. On the way we went through a small town, Silver City, where the main thoroughfare was blocked due to a down tree. In fact we saw many downed trees from this morning’s storm. Hopefully there was no structural damage – we didn’t see any. We went to the Visitor’s Center at the park and as we approached and saw the opened door we realized that they too were without electricity. We went in the darkened gift shop, bought a couple of magnets and then got directions to the Lake of Clouds which was only about seven miles further. We parked and then walked 300 feet to the observation platform. Truly it’s a pretty lake surrounded by heavy forests but I’m glad we didn’t drive a long way to get there! It paled in comparison to Bond Falls. We would really have enjoyed some hiking there but just didn’t have enough time. On the way back we stopped so I could stick my toes in Lake Superior. Jerry got some “interesting” shots of that! 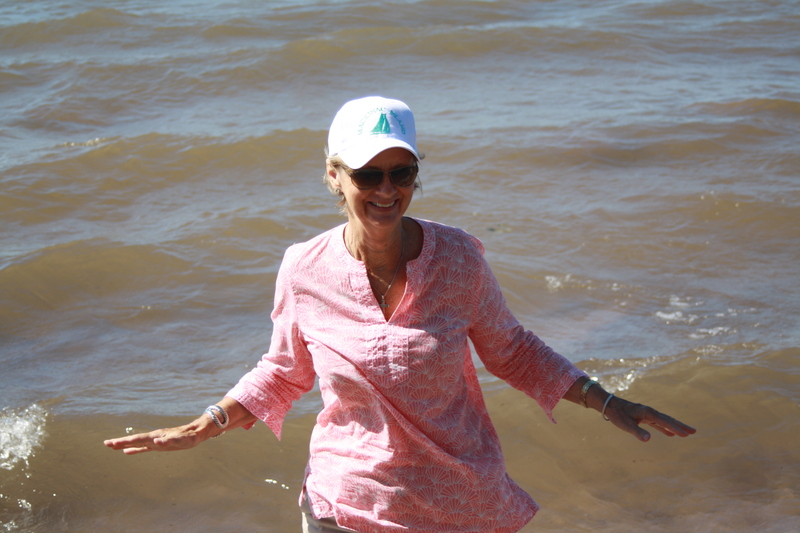 It was a little choppy and I got a little wet – and sandy but hey, I was in Lake Superior! A quick stop at the local IGA and we were back at the campground hoping for electricity. Nope, still none. Several campers have left and those that are here don’t appear to be home. One thing that I have missed on this trip is the comradery of campers. For some reason people have not been out and about and we haven’t gotten to meet many people. This morning I tried a new recipe, pork chops, potatoes and onions in the crock pot. It’s been cooking all day – wonder if we need to find somewhere to eat tonight! After a nice dinner, a keeper recipe, Jerry made another batch of sausage balls and I got out my cross stitch and tried to get enough borders done so I can stitch tomorrow as we drive. While the sausage balls cooked Jerry and I got the car on the dolly and Jerry emptied the black tanks. Tomorrow morning he will just have to unplug the water and electric and we’ll be ready to go. Let’s hope we can get an early start as we have about 250 miles to go to reach Fremont, WI. It’s a noisy campground tonight as everyone has their generators going. Hoping we can sleep!